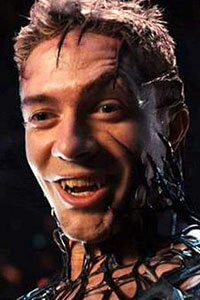 Eddie Brock is a photographer and friend of Gwen Stacy, whom he often used as a model for his photography. While Gwen viewed Eddie as just a friend, Eddie hoped they would become more than that. When Brock got a staff photographer position over Peter Parker, he felt on top of the world. But the rug was quickly pulled from underneath him when Parker proved one of Eddie’s pictures was a fake, leading to Brock getting fired. Between the loss of his job and Parker dating Gwen Stacy, Brock vowed to end Parker. When he fused with an alien symbiote and became the villain Venom he decided to attack Spider-Man, aware of his secret identity. Even though Parker managed to separate the alien and the human, a last-minute attempt by Brock to reunite with the alien led to his death, killed by a bomb.